By 2050, older people will outnumber the young for the first time. It is also estimated that there will be over one billion people over the age of 60 by 2025. In our aging population, the proportion of older citizens is increasing rather than decreasing. But, many are battling loneliness and locked out of the digital world and seamless sharing of photos and online conversations. Scott has already shared his story on my daily tech podcast, but I wanted to invite a medical professional onto the show to learn more about their experiences with older adults and how technology can help them. 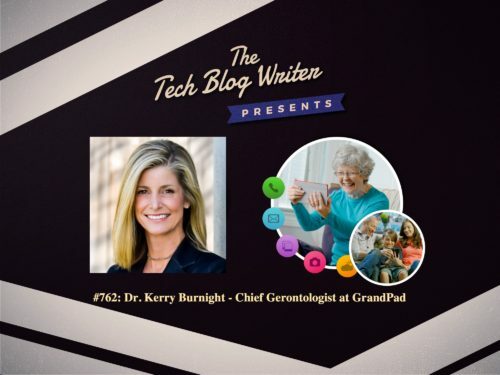 Dr. Kerry Burnight has spent her entire professional career on a mission to improve the lives of seniors. She was a professor of Geriatric Medicine and Gerontology at the University of California Irvine, and she is the founder and director of the nation’s first Elder Abuse Forensic Center and national non-profit, Ageless Alliance: United Against Elder Abuse. Kerry has spoken at The White House and continues to call for solutions to prevent elder abuse. She joined GrandPad because of the firm’s ability to prevent one of the most significant risk factors for elders: social isolation. She has also appeared on television to speak as an expert on shows such as The Dr. Phil Show, CBS news, Money Matters, and The Doctors. Next Post761: Aeternity - Can Blockchain and GDPR Be Compatible?